In the final hours of the Easter Rising of 1916, from the evening of Friday the 28th of April to the morning of Saturday the 29th, soldiers of the British Army’s South Staffordshire Regiment, led by Lieutenant Colonel Henry Taylor, inflicted a terrible revenge for the would-be revolution on the civilian population of North King Street, a working-class district to the north-east of Dublin’s main thoroughfares. Despite their overwhelming numbers, firepower and the use of improvised armoured cars the United Kingdom’s forces had been thwarted in the area by a handful of units attached to the Four Courts Garrison of the Irish Republican Army led by Commandant Edward Daly, advancing no further than 140 meters into the insurgents’ lines after three days of fighting. Seizing civilian hostages in the warren of narrow streets, tenement houses and small businesses that characterized that part of the capital, from 6pm to 10am the troops proceeded to murder at least seventeen men and boys, wounding several others, while stealing from both the corpses and their homes in scenes of general looting. Most of the killings took place in a small block of just nine buildings. At the address of No. 170 North King Street, a disused, partly ruinous building, Thomas Hickey (age 38), his son Christopher Hickey (age 16) and neighbour Peter Connolly (age 39) were beaten, bayoneted and shot to death, their bodies buried in the back yard of the house. The three had been taken from No. 168, the shop owned by the Hickey family at the corner of Beresford Street, and brought two houses up to be tortured and murdered out of sight or earshot of witnesses. At No. 177, Mary O’Rourke’s public house, the foreman Patrick Bealen (30) and James Healy (44), a clerk at Jameson’s Distillery on Bow Street, were shot multiple times, their bodies buried in a shallow pit in the basement; before his death Paddy had made tea for his soon-to-be military killers. In No. 174, a local shop, Michael Nunan (34), a sales-assistant and brother of the owner, and George Ennis (51), a carriage body maker at Moore’s Factory, were tortured with bayonets and shot; the bloodied Ennis managed to crawl back to his wife, Kate, and died in her arms twenty minutes later. At No. 91 Edward Dunne (43), a general labourer, was beaten and executed, leaving behind his wife Jane and at least one daughter. At No. 172, another small shop, owner Michael Hughes (50) and John Walsh (34), a neighbouring cattle drover and former soldier who sought refuge in the address along with his family, were also gunned down; their murders were witnessed by their families. Michael and Sally Hughes had opened their business just two days before the insurrection and the building was still half empty. In No. 27 North King Street, the premises of the “Louth Dairy”, Peter J Lawless (21), the son of the owner and a citizen of the United States, James “Jim” McCarthy (36), manager of Gallagher’s Tobacco Store in Dame Street, James Finnegan (40) and Patrick Hoey (25), both bread-car drivers and tenants in the building, were beaten and their throats slit; their partially scorched corpses were buried by soldiers overnight in the rear yard of the business. On nearby Coleraine Street John Biernes (50), who worked at Monk’s Bakery on the corner of North King Street and Upper Church Street, was shot dead by a British sniper, while William O’Neill (the young brother-in-law of the murdered John Walsh above) was killed by the same marksman when he and a second man went to retrieve Biernes’ body some time later. On Constitution Hill James Moore was shot dead by passing troops as he stood on his doorstep in Little Britain Street, again almost certainly by soldiers belonging to the rampaging contingents from the 2/6th Battalion TF South Staffordshire Regiment. Which simply gave further support to the order issued during the fighting by Brigadier-General William Lowe, the UK commander in Dublin, that known or suspected “rebels” were not to be taken prisoner. 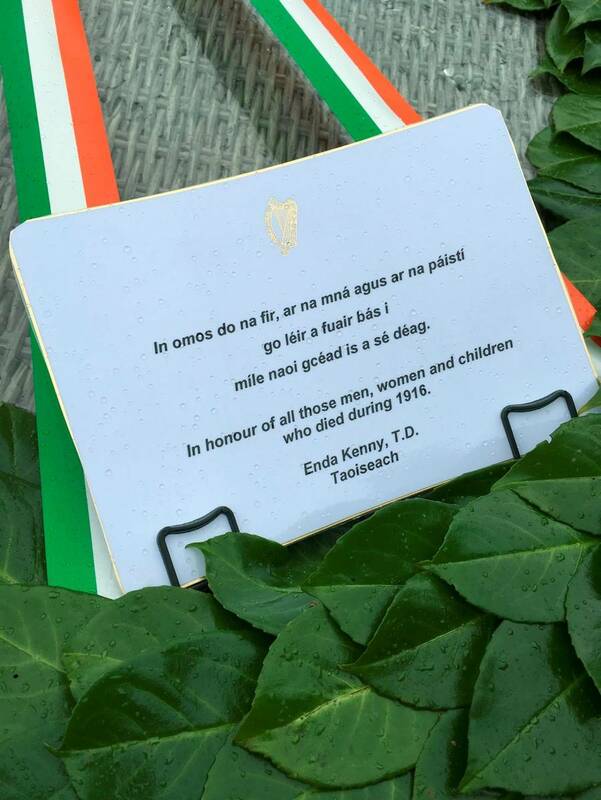 Incredibly the modern state of Ireland has now paid tribute to perpetrators of the North King Street Massacre, to the murderers of Irish men and boys, by adding their names to the newly erected Glasnevin 1916 Remembrance Wall, a monument inscribed with the names of all those who died during the Easter Rising. Alongside sixteen year old Christopher Hickey and twenty-one year old Peter J Lawless sits the names of the men who were their killers or the accomplices of their killers. Far from a Remembrance Wall it has become a Wall of Shame, a dishonouring of the dead. One such name from the so-called 1916 Remembrance Wall is that of Harry Dickinson, a member of the infamous South Staffordshire Regiment, who died of wounds on the 12th of May 1916, probably received while fighting in the North King Street area, site of the massacre. The unfortunate Dickinson is buried in the Grangegorman Military Cemetery, a former UK graveyard near the Phoenix Park in Dublin, and his name is already inscribed on its Wall of Remembrance. With the support of the Royal British Legion and the government of Britain, and regarded by them as a “Fallen Hero”, Harry Dickinson will now receive greater recognition than the citizens of Ireland he and his fellow soldiers murdered. Meanwhile several of those who died in North King Street were, until recently, buried in unmarked graves at Dean’s Grange Cemetery. To add insult to injury, and to illustrate even further the facile Irishness of the political establishment on this island nation, which fears even the memory of the 1916 revolution, the Irish text on the Glasnevin monument is misspelled. Éirí amach “rising out” becomes Eírí amach, which has no meaning at all. Much like the official celebrations of the Easter Rising, in fact. A short book, titled “A Fragment of 1916 History“, gives a full description of the murders by the family, friends and neighbours who witnessed them on those terrifying two days one hundred years ago. 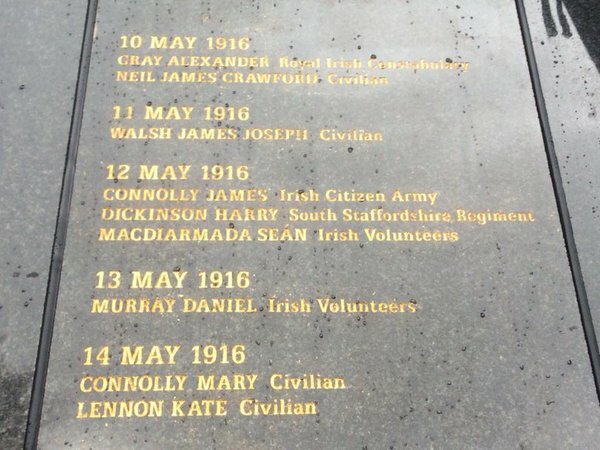 UPDATE 06.04.2016: Will The Black And Tans Be Added To The Glasnevin Wall of Shame? utterly tragic. but typical. The storm that came afterwards was worse. Indeed. Starting with omos = ómós, and carrying on from there. Just unbelievable. Could one imagine the Poles adding the names of dead Nazis to the Remembrance Wall of the Warsaw Rising? And in bad Polish? this is disgusting. you should write a history of the dublin and monaghan bombings cover up. they are still at it. I don’t agree with this wall at all but, unfortunately, what is done is done. The mistakes are disgraceful, to say the least. Here is another that I came across last night. 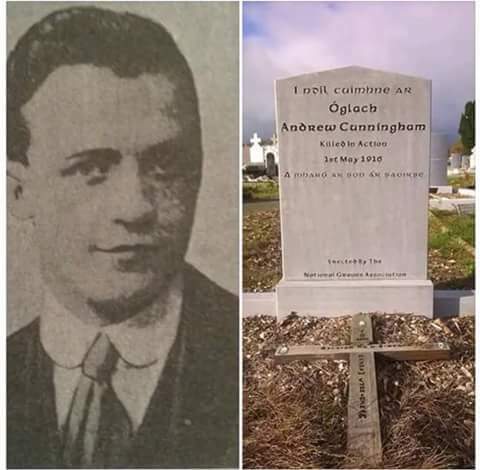 I’m sure the family of Óglach/ Volunteer Andrew Cunningham are not happy! Incredible, isn’t it? I understand that more stories will be forthcoming soon. What’s done can be undone. Stone can be worked, chiseled, and those names of the oppressors removed. The empty areas can be redone with Celtic symbols. It will cost, but it can be done and, should be done, in my opinion. Surely the place for the British military is Islandbridge. What else is it for? Why “who died in 1916”? I thought this was about the Easter Rising not simply a year picked at random? Millions of people died in 1916 around the world and I hope Glasnevin and the Acting Taoiseach are not trying to claim them too. It seems Endof cannot say “Easter Rising” – for some reason it appears to stick in his craw. Has anyone considered the significance of a wall? As the people of Belfast will tell you, it is a barrier, a block to integration. So why was it chosen for this “inclusive” insult to all? This wall is a terrible insult to those who fought for freedom in 1916 but it is exactly as I expect from a FG government. They have stooped as low as they can go this time. They have caused terrible hurt.They failed in their duty of care by not consulting the next of kin of the nationalist fighters. I expect nothing can get this revisionist nonsence of a wall out of sight but legal action, like what had to be done to prevent Fine Gael from demolishing the Moore St. battlesite. 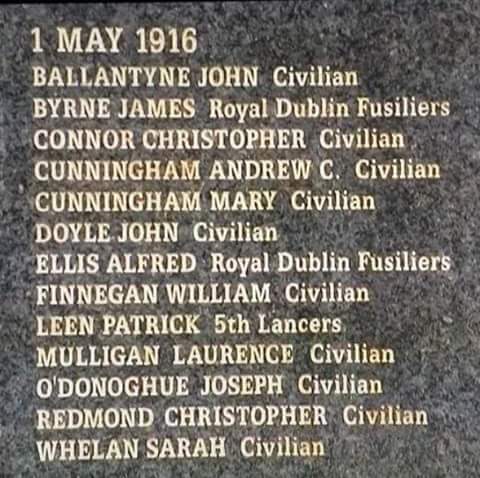 Putting the names of civilians on it was intended to deflect attention from the fact that all they wanted to do was honour those who fought in British uniform. Enda Kenny is unable to utter the word nationalism. His allegiance is to Britain and his rule has set us back a 100 years to when the British were in power. We have not seen the last of it yet. Kenny is waiting in glee for the Black and Tan names to go up.